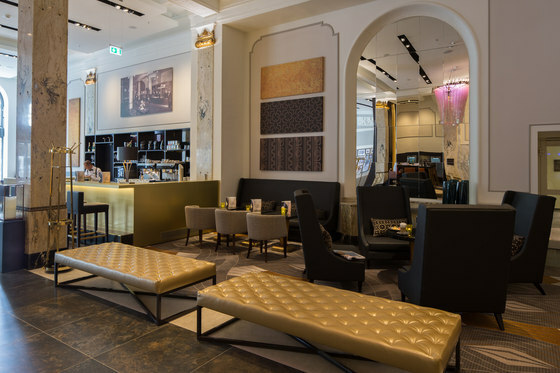 JOI-Design’s extensive renovation of the Reichshof Hamburg’s architectural structure and interiors not only reinstates the impressive grandeur of the city’s beloved but worn landmark, it also launches the European debut of Curio - A Collection by Hilton. 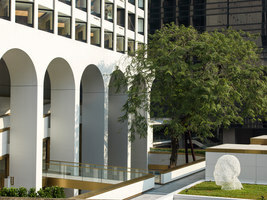 The building’s original Empire and Art Deco aesthetics have been bridged with modern comforts and local cultural references, culminating in a stylish interpretation of the Curio brand’s calling card: uniquely storied hotels that provide travellers who have a passion for discovery with a taste of the authentic flavour of communities. 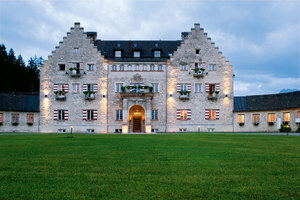 The result is a stately flagship that establishes the benchmark for Hilton’s future Curio properties in Europe. 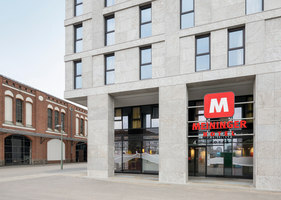 Located in the heart of Hamburg at the market opposite the central train station, the hotel first opened in 1910 with a design inspired by the city’s rich maritime history and reputation as a Hanseatic mercantile centre; its impressive Art Deco façade was added in the 1920s. 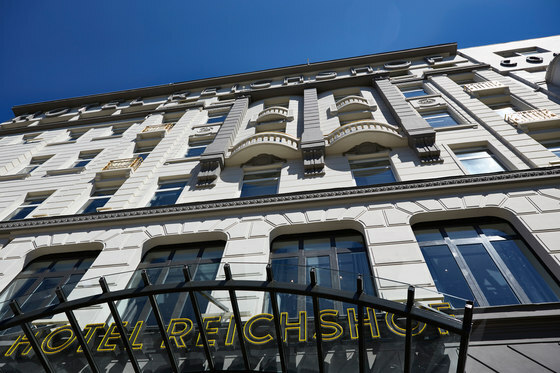 In an era when international voyages were increasingly possible, the Reichshof’s founder Anton Emil Langer wanted to reveal “the world of travel” to Hamburgers and fused this notion into the hotel’s original cosmopolitan concept. 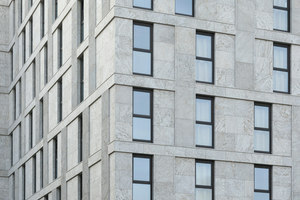 A century later, JOI-Design has inverted Langer’s idea for the restoration of this designated historical monument, instead taking guests on a journey through Hamburg’s heritage. For the revamp of the public areas and guestrooms, the studio was entrusted with a flexible brief guided only by overall budget, essential brand standards, and the opportunity to freely translate Curio’s premise into something memorable. 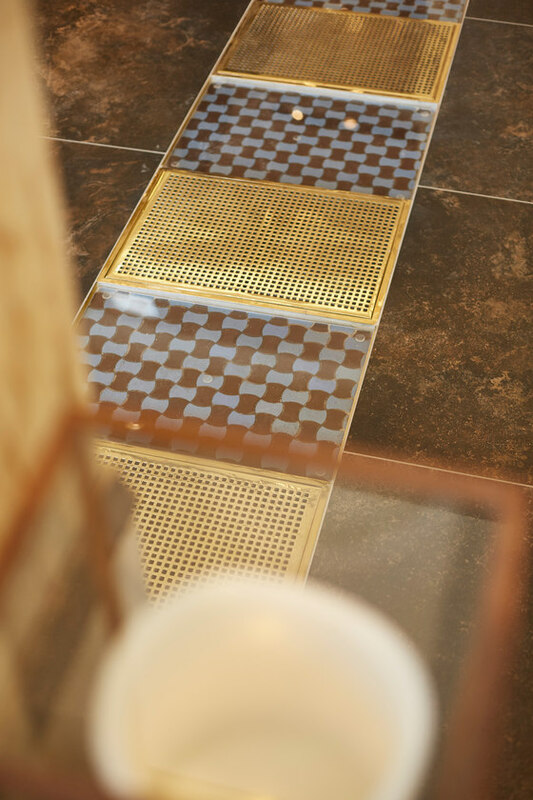 The designers aimed to highlight the hotel’s beautifully preserved Art Deco era details like its impressive marble columns, timber panelling and brass detailing, restoring them as needed is a manner suitable for this listed building. 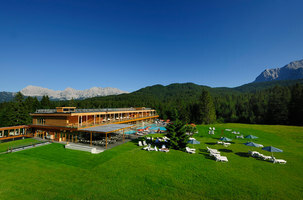 At the same time, they have modernised the infrastructure to international standards by discreetly integrating the latest technologies so that the hotel is equipped for the future. 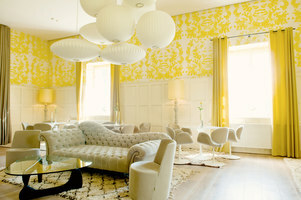 The lobby of The Reichshof is the largest and longest in Hamburg, as well as having one of the tallest ceiling heights. 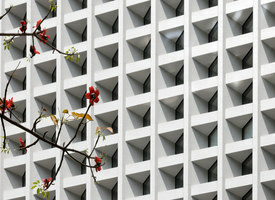 JOI-Design’s concept celebrates this, and in doing so emphasises the hotel’s sense of grandeur. Key to realising this aim was the total reconfiguration of the lobby. 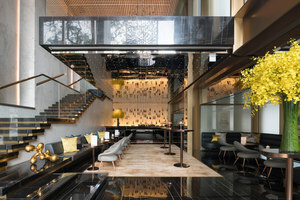 A mezzanine level that had been added decades after the hotel’s initial opening was demolished, thus restoring the intended effect of the building’s original design. 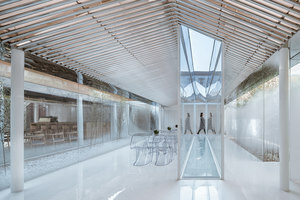 The result is a space that feels much more open and impressive. 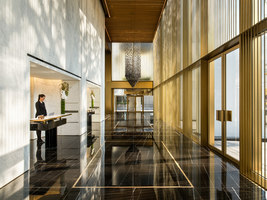 Informed by the understanding that carefully considered layouts facilitate seamless service delivery, the designers also optimised the spatial arrangement of the lobby so that efficiency is increased while guests’ comfort and ease of navigation is enhanced. 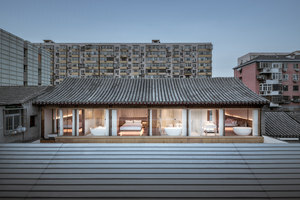 In addition, this rationalisation of space increases the variety of revenue streams by expanding the way in which the public areas can be used. The reception desk has been relocated from the entrance to the furthest most point at the back of the lobby, thus freeing-up the area at the street-side glazing. 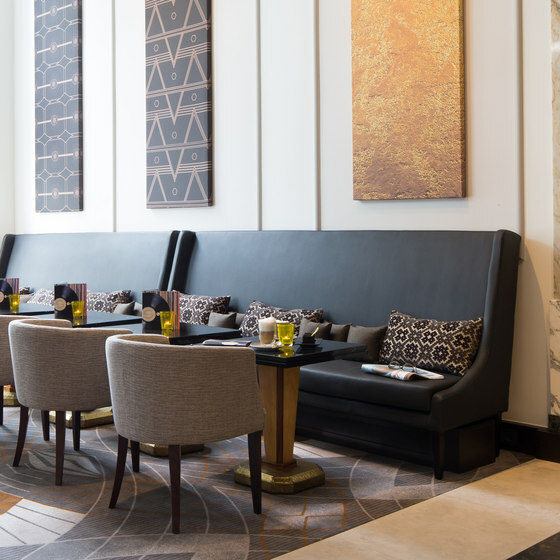 The eye-catching curb appeal of the lively central lounge has been designed to attract passers-by and establish an immediate sense of welcome that reduces the potential intimidation of entering a luxury hotel. As a modern living room for city nomads, its eclectic décor feels inviting and relaxed; the button tufting and nailhead trim of the traditional caramel leather sofas mixes comfortably with modern platinum leather lounge chairs and organically shaped poufs. A collection of contemporary and vintage black and white photographs, artwork and adverts from Hamburg emphasises the building’s heritage from times past to the present day. Seating arrangements can be reconfigured for different group sizes, and electrical points permit guests to charge digital devices and encourage the likelihood of informal business appointments taking place here, although the hotel does offer newly modernised conventional conference rooms too. Nesting coffee tables aid flexibility so everyone has a place for beverages. Hung above the new daytime bar is sepia-toned photograph of the hotel lobby as it looked in its early days. Intentionally introduced near the entrance, its counter displays mouth-watering cakes to further entice pedestrians to come inside. 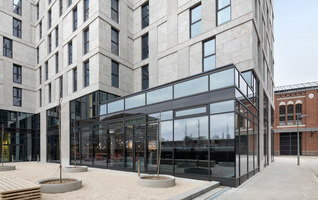 While fresh sushi and decadent sweets are available at all times, a modern take on classic high tea will be offered in the afternoons – a natural extension of the hotel’s long-held reputation for serving the city’s best tea and coffee due to Langer’s original introduction of the property’s own water source originating on Lüneburger Heath. 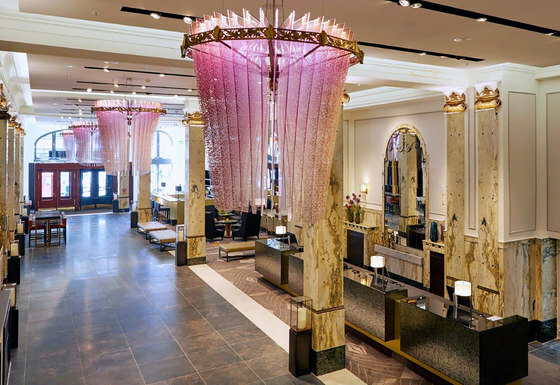 Fountains dispersed throughout the hotel and the complimentary “grab-n-go” refrigerator in the lobby also provide guests with a continuous supply of fresh still or sparkling water. 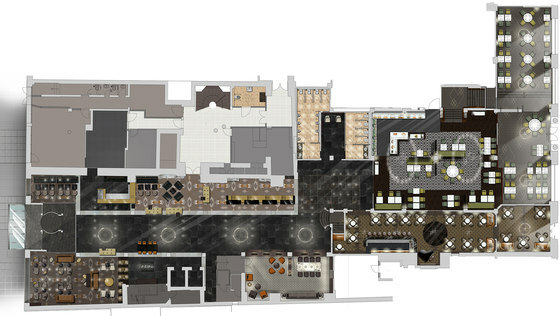 Easily identifiable areas radiate off the central lobby, with the reception desks and daytime bar / bistro / café / sushi bar on one side and then Bar 1910, the “vinyl lounge” and slowman restaurant on the other. 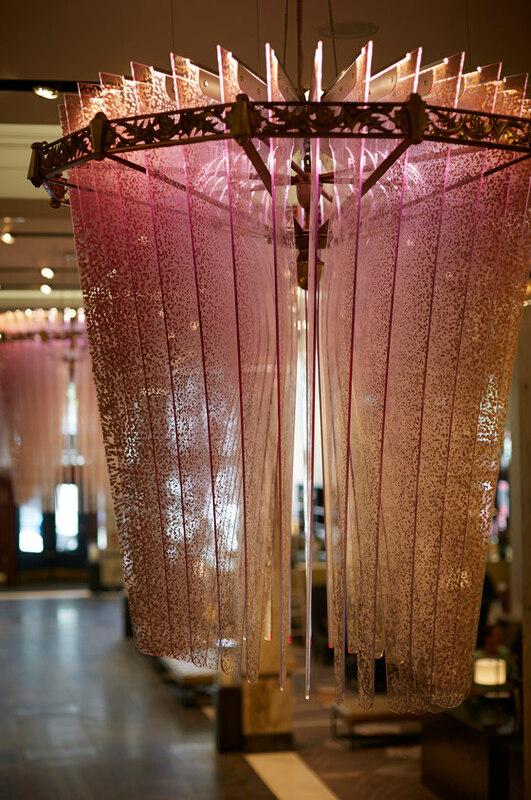 Standing out against the neutral background are glimmering contemporary chandeliers crafted with pink resin to a bespoke style by JOI-Design, while red pendant lights hung in the lounge’s wall niches add zip. The hotel reception desk’s new location at the back of the lobby places it conveniently across from the lifts. 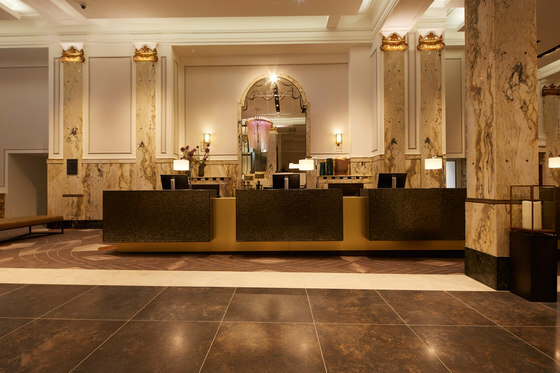 Split into distinct stations, designated podiums for check-in and out and dining reservations organise the circulation space so that it does not feel congested. 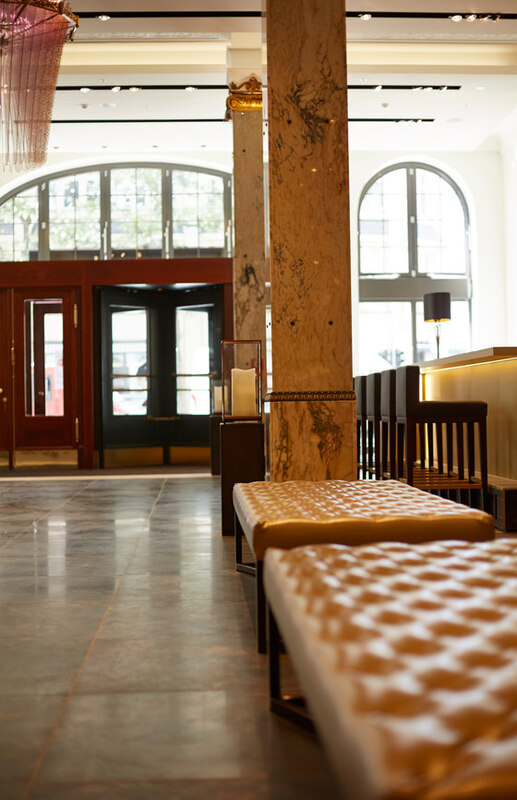 Nestled into the far corner of the lobby is a private “vinyl lounge” reserved exclusively for hotel residents. Designed with soothing shades of grey and purple to form a relaxing retreat, it is kitted-out with turntables, vintage records, and headphones so that guests can unwind in a chilled atmosphere. The lack of a street entrance means slowman is secreted away from the bustle of the outside world and enhances its sense of exclusivity. 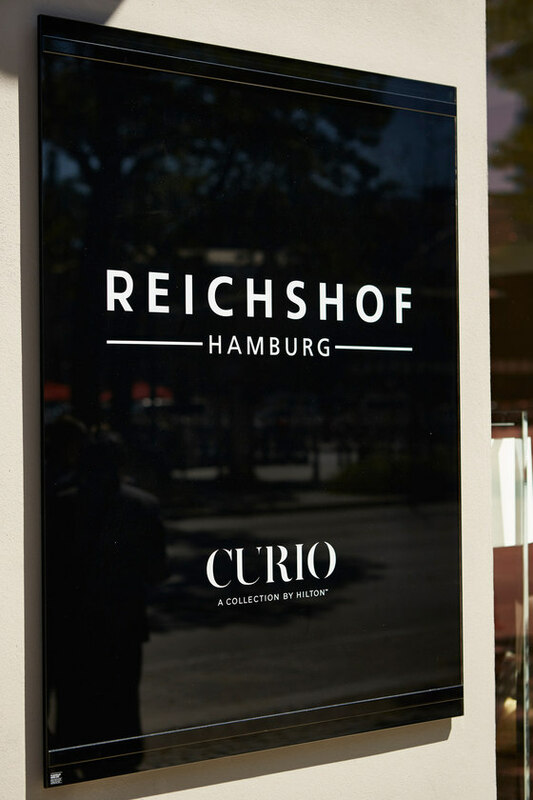 Relocated to the Reichshof from a former site, the establishment is part of the stable backed by Michelin-starred chef turned restaurateur Christian Rach who is acclaimed for television programmes in which he teaches restaurant skills to the underprivileged. 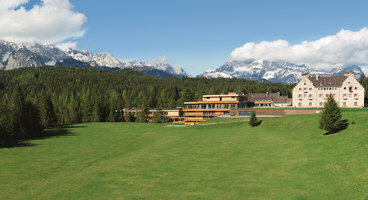 Led by head chef Frank Bertram, slowman has been conceived to immerse diners in a grand culinary experience and prides itself on artisanal specialties of the region prepared from fair trade, sustainably produced ingredients sourced from local suppliers according to rhythms of nature. The initial vision of founder Herr Langer remains alive one century later, with his concept inspired by the SS Cap Polonio, a luxury transatlantic cruise-ship built in Hamburg, still intact. 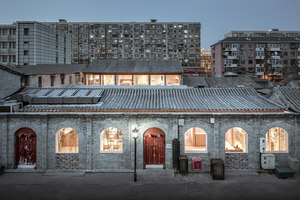 JOI-Design’s renovation of the double-height space was restrained so as not to undermine its extraordinarily well-preserved interiors. Original features like the finely crafted satin timber panelling and the illuminated, dramatically veined marble, copper and gold columns were carefully restored. New furniture and fittings designed by the studio are of a complementary style, for example the polished Bianca Carrara dining tables, soft velvet and leather seating, dark timber flooring, and custom-made lamps created to match those existing. A primary goal of the design was to increase the efficiency of service delivery from morning through to night. 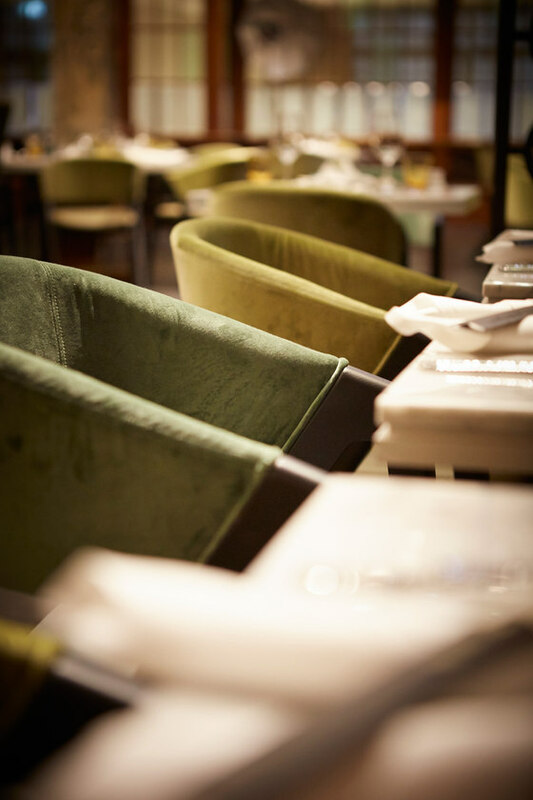 High tables and barstools located next to an enlarged buffet area are ideal for patrons seeking a casual meal or a quick bite, especially during the peak breakfast period, while sumptuous leather banquettes are better suited for relaxed occasions. 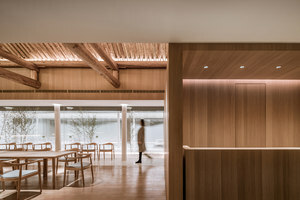 The kitchen opens directly onto the buffet space; however, a cleverly planned corridor placed at a 90° angle prevents diners from viewing the prep areas. A reconfiguration of the layout for the marble tables provides increased seating numbers and options for different group sizes, with open-lattice screens that create a sense of intimacy within the vast space whilst allowing waiters to keep an eye on the flow of activity. The restaurant’s elegant staircase sweeps up to a dining gallery adjacent to the conference rooms; a newly added service lift means that waiters no longer need to cross through the ground level to reach guests in the mezzanine. The original, beautifully crafted timber joinery and embossed ceilings of Hamburg’s celebrated evening hotspot Bar 1910, formerly called M&M Bar, have been sensitively renewed. A low ceiling height, clusters of rich leather tub chairs and marble cocktail tables, and soft illumination from the wall lamps and recessed soffit lights help create the handsome, clubby feel of a private members’ bolthole. The marble bar extends the length of the restaurant and showcases the wide variety of spirits available for crafting the venue’s acclaimed cocktails. 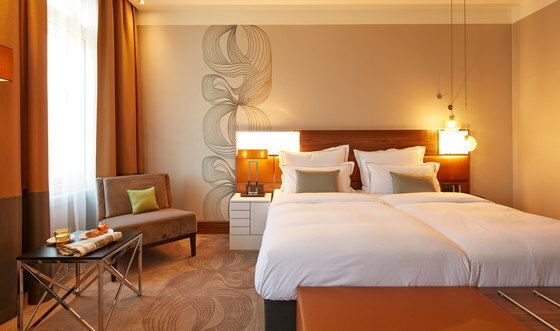 In order to provide a more spacious feel, JOI-Design reduced the room count from 300 to 278 guestrooms, six junior suites and three one bedroom suites, all refreshed with discreet allusions to the Art Deco era. Flooded with light, the elegant proportioned, taupe coloured rooms have been designed with comfort mind. On one side of the bed is a glossy white cabinet and on the other, a pedestal nightstand formed composed of a circular shelf that seems to floats atop an angular, polished steel base. Above each are charging points for guests’ mobile devices. The headboard has been crafted as an asymmetric composition of panels, with padded leather headrests and timber segments inset with backlit sections that emit diffused light. Affixed to the wall behind the bed are pendant lights with faceted crystal globes that add ambient illumination, while unwanted light leakage has been concealed by recessing the curtains into niches within the dropped ceiling. A sinuous ribbon pattern has been carefully coordinated to stretch across the floor’s carpet and onto the wallcovering, bringing a sense of fluidity to the ambience. Plush lounge chairs in neutral tones are enlivened by green cushions and a side table whose shiny triangular legs inject a dynamic energy.